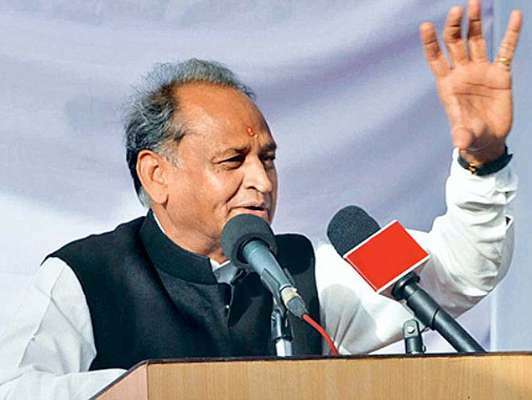 Rajasthan Chief Minister Ashok Gehlot on Saturday appealed to the Gujjar community protesting in the state to maintain peace and meet Prime minister Narendra Modi with their demand of five per cent reservation which could be fulfilled only through a Constitutional amendment. Mr Gehlot told reporters here that the leaders of the Gujjar community should talk to the state government and they should not sit on rail tracks as people are facing hardships following cancellation and diversion of trains. He said, "I appeal to them not to sit on the rail track. Their demand can only be achieved through constitutional amendment and for which they should give a memorandum to the Prime Minister." The Gujjars had staged a ‘rasta-roko’ dharna on Friday in Sawai Madhopur stating that they were promised implementation of five per cent reservation by the state government. The protests are being held under the banner of the Gujjar Arakshan Sangharsh Samiti (GASS) led by Gujjar leader Kirori Singh Bainsla. Due to protest, rail traffic has been affected. So far 14 trains have been cancelled and 20 trains have been diverted.